My life story is centered around a single purpose of helping the world change and sustain behaviors they never thought were possible. 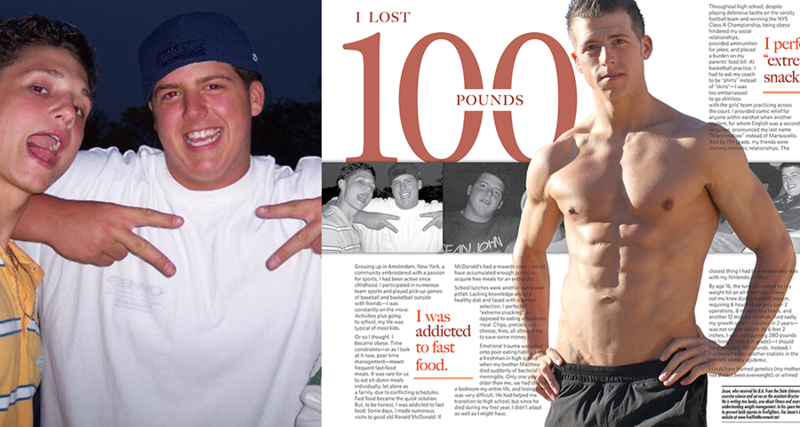 At the age of 16, I was tipping the scales at over 300lbs! With no money or social support, but a hefty appetite to change, I took matters into my hands architecting healthier habits, losing over 100lbs, and forged a new lifestyle. My weight loss has created a burning curiosity and passion to understand how we change and sustain behavior. My story and writing has been featured in Men’s Journal, Runner’s World, Journal of Strength and Conditioning Research, Shape Magazine and The Boston Globe. On December 4, 2002, I watched my 16 year old brother die in front of my eyes from a rare disease called bacterial meningitis. Matt’s death has become the single best thing to ever happen to me. He has given me the greatest gift – the meaning of death. At any point in life we can die for any number of reasons which taught me not to waste time on meaningless activities and cherish every moment. Appreciating death removes the worry and strips unnecessary fear that paralyzes us from action. Matt has forged my focus and awakened energy on the activities and people that are most important in life. Until we learn to appreciate death, we may never fully realize the true value and meaning of life. It doesn’t matter if we live to 16, 40, or 100 years old, but what does matters is what we do with those years. Every day I wake up and look at my brother’s football jersey framed on the wall which reminds me to ask myself “if I were to die tomorrow would I be satisfied with my impact in the world?” The answer is always no, which inspires me to write, work harder and make my mark on the world as Matt would have wanted. My educational trajectory has a story which follows my curiosity for how and why I lost 100lbs. It started in the frozen tundra of upstate NY, where I studied sociology. During undergraduate I fell in love with exercise and health which left me craving more knowledge. I ditched the cold weather and moved to Florida to immerse myself in the sunshine and the science of exercise, human movement, motor learning, nutrition, biomechanics, and physiology. Having completed my master’s degree, taught coursework, published research and led the public health stress lab I felt confident to enter the ‘real world’. 3 degrees and a diversity work experiences from business consulting, health coaching, leading a public health research lab, to owning a business, has outfitted my understanding of how and why we do what we do. Lifestyle Architecture program was focused on the process development, integration, progression and maintenance of healthy decision making for long-term sustainability of health. Lifestyle Architecture was featured in numerous media outlets and the topic of over 20 national and international presentations where I shared behavior change success principles. Working in the health field made me realize changing our behavior was not a job for health to solve. My experience pointed me toward understanding the human mind and the place to do this was behavioral science. I tossed in the towel with health and pivoted my career for behavioral science, business consulting, and marketing. I was fortunate to start my consulting career with Catalyst Behavioral Sciences and mentored by David Neal, Ph.D., one of the leading psychologist in habit formation who pushed my thinking and rigor in applying behavioral science in the real world. I went back to business school earning an MBA, which combining with behavioral science and marketing, were the missing ingredients to understanding behavior change. When you work with leading Fortune 500 brands such as Bayer, Clorox, SCJ, Nike, P&G, Microsoft, Unilever, and Intel it opens up the reality we face when trying to change our behaviors. Creating large scale change is not an individual sport but a complex multi-player game with many people invested in our both helping and potentially hurting our chances of success. I presently embrace my passion for applying behavioral science commercially with BEESY.